Japan Business Library Association (JBLA) is a non-profit organization, established in December 2000, seeking a way how public libraries can be involved in the local communities and becoming an agent to support local businesses. We believe public libraries are a key to make the country a better place for people to live. We aim to promote all kinds of libraries’ commitment in local economy. We support our members’ professional development as a business librarian and facilitate networking among members. Mailshot where members can exchange information, thoughts, and inquiries. JBLA currently has two working groups. Their accomplishments are also shared with the members regularly. Developing a basic list of reference books, databases, books and journals which are “must-have”s when a library enhances business information services. Studying current situation about business libraries and its services in other countries. Note) The numbers from 2000 to 2011 are based on the annual survey conducted by JBLA. 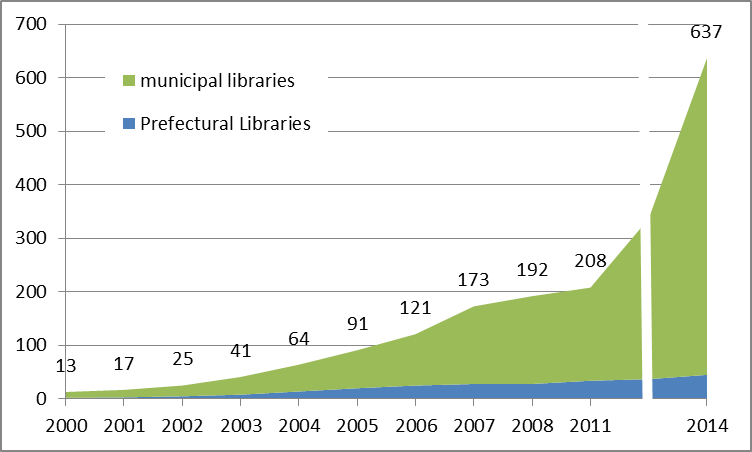 The number of 2014 is quoted from the study carried out in 2015 by National Council of Public Libraries, Japan.